Baboons in the Cape Peninsula are in the news again this weekend. Last week there was a report of a male baboon attacking a visitor at Cape Point and biting her. The baboons in this area are normally attracted to food visitors are carrying and make a grab for it and run away. In this particular incident the visitor opened the boot of her car to get out her handbag and was attacked when she refused to let the baboon take it from her. 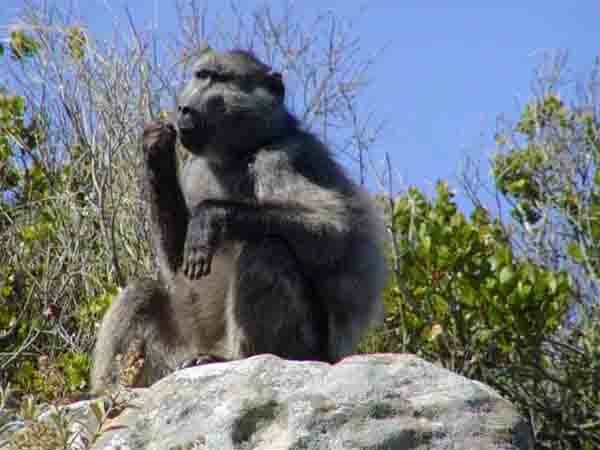 Cape Point has a pack of Chacma baboons which inhabit the area near Cape Point. The parking area at the base of the Cape Point hill is where one will normally find the baboons mingling with the people visiting Cape Point. They are not scared of people and the minute they see anybody with a bag or something like food in their hands make a run at the person and grab the bag and then run away. It's actually quite funny to watch when it happens, especially some of the people's reactions. Of course to wrestle with the baboon can be extremely dangerous as it has some very sharp teeth which can leave you with a nasty bite and a wound that could quite easily turn septic. The main cause of the problem at Cape Point is that there is a fast food outlet serving food in the carpark. The baboons know this and watch the people leaving the counter area with a bag which they then make a grab for. In the 1960's before the upgrade of the area the baboons were scared off by an explosion that was set off in the parking area every now and again when the baboons became too much of a nuisance. That no longer occurs although there are a number of Nature Conservation officials sitting around the parking area who are supposed to be on the lookout for the baboons getting up to mischief. Not only are the baboons a nuisance at Cape Point but also in some of the surrounding towns and villages in the southern peninsula. When I lived in Kommetjie in the 1960's we never saw a baboon even when we climbed the mountains above Kommetjie. These days the baboons roam the streets and break into the resident's houses looking for food. An aunt of mine who lives in Kommetjie caught a baboon in her kitchen the other day and when it saw her it escaped through a window and ran away. Before leaving it opened her fridge and helped itself to food stored there as well as some fruit that was in a bowl on the kitchen table. The baboons are very clever, as they know how to avoid an electric fence that surrounds the house. At Cape Point they also have an electric fence to try and keep the baboons out of the parking area. They have however found a gap between two of the fence poles and use this to gain access to the car park. The Nature Conservation authorities from time to time identify dangerous male baboons and then capture and shoot them. This unfortunately does not solve the problem, as soon, a male from another troop finds the leaderless troop of baboons and takes over the females ousting the young males in the troop. When a new dominant male takes over a troop any babies in the troop are murdered by the new male so that the females will begin ovulating again. Female baboons do not ovulate while nursing their young. This causes many problems in the hierarchy of the troop. Unfortunately the problem at Cape Point soon repeats itself when the new male finds out that food is available from the parking area at Cape Point. He soon becomes a threat and has to be removed thus starting a whole new sequence of murder and mayhem when a new male comes along. It's a pity that the authorities cannot find a way of preventing the males from becoming a nuisance and so prevent the circle of violence that will eventually lead to the extinction of the troops of baboons in the Southern Peninsula. The baboons however will remain a feature in the parking area at Cape Point so look out for them when you next visit the park.